The grade two students at Blackville School are participating in the Roots of Empathy program. With this program, the students are able to interact with a baby from the local area. This year, the baby is a little boy named Hudson, born on July 30, 2015. He is visiting the students every few weeks. His first visit was on Tuesday, February 23. The students are able to watch him grow and see how he changed and developed between each visit. 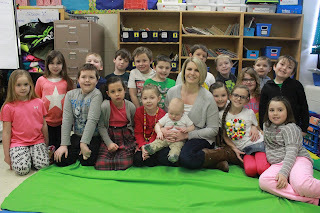 The students look forward to seeing baby Hudson and enjoy each visit. To find out more about the program, click here.